LBP in children and adolescence is an important and increasing problem, and prevalence increases with age. Systematic review and meta-analysis studies of LBP in adolescence found mean LBP point prevalence and one-year prevalence for adolescents to be around 12%, and 33% respectively[2, 3]. Watson et al. reported a one month period prevalence of 24% in schoolchildren aged 11–14 years in northwest England. Historically considered as trivial and non-limiting, LBP in this age-group may have both immediate and long-term consequences for an important proportion of those affected. Risk factors have been debated, although ergonomics of school furniture, school bag weight and mechanics, trauma, history of scoliosis, and involvement of strenuous physical activity may be associative or causative factors in young persons with LBP. There is also increasing evidence that psychological and psychosocial factors may play a significant influence in the aetiology of LBP in this age group[6, 7]. Most cases of LBP in the younger population are considered ‘mechanical’ and ‘uncomplicated’, with pathological causes such as neoplasm and infection being very rare. Conservative management and natural history are quite favourable, with the percentage of cases that persist with discomfort longer than one week being less than 15%[5, 6]. Therefore, should a young person diagnosed with uncomplicated LBP not respond as quickly as expected to conservative management, pathological causes should again be considered and further clinical examination undertaken. Additionally, less common, non-pathological causes of low back pain such as ‘active’ spondylolysis must be re-introduced into the differential diagnosis. An important and probably underappreciated source of LBP in children and young adolescent persons is the intervertebral disc (IVD) joint. Lumbar disc herniation (LDH), encompassing the categories of protrusion, extrusion, and sequestration is well known to cause LBP[9–11]. Involved in the herniation process are annular tears and other intervertebral joint sources of LBP such as end plate subchondral oedema. For the paediatric patient lumbar disc herniation is less common compared to adults, affecting no more than 5% of the population, and paediatric patients have been shown to constitute only 0.5–6.8% of all patients hospitalized for LDH. Multiple factors have been identified as potential causes, with 30–60% of cases of children and adolescents with symptomatic LDH having had a history of trauma before the onset of their LBP. Posterior view of patient in neutral lumbar ROM. The posterior view shows a non-distressed young male with no visible scoliosis or antalgia. Posterior view of patient in end-range active flexion lumbar ROM. This movement reproduced his LBP and created an abnormal right lateral lumbar deviation, appearing to be a possible lumbar scoliotic curve. Lateral lumbar X-ray view. Note the suspicious area of increased sclerosis in the anterior half of the sacral base. Antero-posterior X-ray lumbar view. Note the absence of scoliosis. In this case, lumbar MRI evaluated by the private facility medical radiologist, revealed several clinically relevant findings as a probable cause of his resilient LBP. Figures 5 and6 show several intervertebral disc joint lesions that are of plausible clinical significance. Figure 5 shows two annular tears that can be seen posteriorly as annulus fibrosis hyperintensity, known also as high intensity zone (HIZ), at the L4/5 and L5/S1 discs. The L4/L5 and L5/S1 discs also reveal a shallow focal disc protrusion. At L5/S1, disc height reduction, loss of signal intensity, and mild adjacent L5 and S1 subchondral marrow oedema is seen. Figure 6, reveals a sizeable area of hypointensity (from past intraosseous herniation) seen in the anterior half of the sacral base. This represents chronic marrow repair, most probable from past compressive trauma to the area. Interestingly, this area of damage correlates to the line of sclerosis seen on the AP plain film X-ray. MRI, sagittal STIR midline image. Annular tears are seen as posterior annulus fibrosus hyperintensity (bottom two arrows pointing to white dots) at L4/5 and L5/S1 discs. Compare with low signal (dark) of the normal L3/4 disc (top arrow). MRI, sagittal STIR view. The L5/S1 subchondral bone marrow hyperintensity (areas of white) seen on both sides of the L5/S1 disc (arrows), is suggestive of annular injury and ongoing inflammatory response. L4/5 right paramedian disc protrusion, and L5/S1 disc height reduction with dehydration and right posterolateral disc protrusion that appears chronic. Anterior sacral base bone marrow hypointensity indicates chronic marrow repair. Twenty-one days post initial consultation, the patients third consultation consisted of a review of the MRI findings, as well as a recommendation to the mother that her son attends the additional opinion of a paediatric spine specialist for co-management. The short and long term prognosis of this patient’s low back condition was of utmost importance, particularly as the patient was already in initial stages of puberty and therefore his growth will be highly accelerated in the following years. His antalgia and chronic low back pain were significantly affecting his quality of life, and his chronic use of NSAID’s in itself constituted a health risk. Referral to a specialist for co-management was deemed the most appropriate short-term measure, in addition to conservative management which would focus primarily on tissue-sparring injury education, postural pain management, core and hip stability rehabilitation, flexibility, and chiropractic passive care. The patient was referred to his medical General Practitioner via letter with a detailed description of clinical situation and imaging results, recommending subsequent specialist referral. Following the third consultation, the patient did not return for further chiropractic management. Most childhood and young adolescent LBP cases are uncomplicated in origin and mechanical in nature. Patients tend to respond quickly and successfully to natural history and/or conservative management, and their back pain only uncommonly progresses to become chronic. Childhood development of chronic LBP is one of the major reasons for chronic LBP in adulthood. Children experiencing persistent or recurrent chronic pain have been shown to miss school, and have higher chance of developing conditions such as depression and anxiety. The chronicity of this patient’s pain and mild relief from conservative management were indications that his LBP was more complex in origin, compared to typical mechanical LBP. The antalgia seen during physical examination motion evaluation was abnormal for a 13 year old, and could not be attributed to a scoliosis. It is unusual for antalgia to be caused by neural or other pernicious pathology. Therefore, it is prudent to consider an intervertebral disc injury as a cause of abnormal painful antalgia in the young adolescent population. Zhu et al. reviewed the clinical features and treatment strategy of LDH in adolescents initially misdiagnosed as idiopathic scoliosis. All patients had initially presented with a scoliotic curve as their chief complaint, yet curvature and disability did not resolve until surgical management of the affected discs was undergone. Many paediatric and early adolescent lumbar disc injuries have been historically attributed to trauma such as falls and sports-related trauma. However, it is becoming more widely regarded that, as in adult LDH, in some cases minor trauma and/or repetitive biomechanical stress may be the provocative event in the exacerbation of a disc that is already herniating and/or undergoing degeneration due to genetic predisposition[11, 12, 16, 17]. Interestingly, up to 57% of adolescent LDH patients have a first degree relative with a lumbar herniation history[11, 12]. Zhu et al. found a high incidence of significant hamstring tightness in adolescent LDH patients, although, it is still unclear whether hamstring tightness is an inducing or ensuing factor of LDH. Our patient had very prominent posterior lower limb myofascial tightness, limited to 45 degrees during SLR test bilaterally. In this case, MRI was helpful in showing annulus fibrosus lesion via HIZ’s, LDH, and inflammatory adjacent marrow oedema. It is reasonable to postulate that these lesions seen on his MRI were significantly involved causes for his chronic LBP. It has been proven that some disc lesions in adults, even when visualized on MRI, are not clinically symptomatic. Kjaer et al. undertook a large study of 439 thirteen-year-old children and assessed lumbar MRI findings. One third of the children showed some sort of lumbar degenerative disc sign, most commonly loss of disc signal intensity. Interestingly, only 24 (5%) had HIZ’s, 11 (3%) had a disc protrusion, 1 (0.5%) had a type 1 Modic change, and 0 (0%) had a type 2 Modic change. Positive associations between degenerative disc findings and self-reported LBP were found, and there was a strong association between those children that ‘sought care of a practitioner for their LBP’ and disc protrusions and HIZ’s. In our case, considering the mechanism of original injury to the lumbar spine some four months prior, and lack of improvement with treatment and natural history, it was assumed that there was reasonable causal relationship between the mechanism of the fall, the intervertebral disc and endplate injuries found on MR Imaging, and his chronic LBP. Most anatomical elements of the lumbar spine and its surrounding soft tissue network contain nociceptive innervations that may be origins of LBP. It is widely accepted that both the outer annulus fibrosus of the IVD and cartilaginous vertebral endplate are sources of discogenic LBP. Discogenic pain can arise from structural failure and bulging of the disc. Our patient’s most uncomfortable daytime position for LBP was sitting. The lumbar disc space pressure is highest in the sitting position, thus putting increased physical and gravitational stress on the patient’s annular tissue and endplates, thus causing mechanical stretch of nociceptors in these areas. Discogenic LBP also originates from nociceptive neural and vascular in-growth in the outer annulus, into annular tears, and can cause peripheral sensitisation. These inflammatory factors may have likely been of partial cause of our patients’ night and morning pain and stiffness. Degenerative vertebral endplate injury and subchondral bone marrow oedema seen on MRI are known as Modic changes, and are arguably a source of LBP[21, 22]. Figure 6 showed the subchondral bone marrow hyperintensity on both sides of the posterior half of the L5/S1 disc which is reflective of inflammatory bone marrow annular injury and ongoing inflammatory response in the subchondral bone (Type 1 Modic). It also showed subchondral marrow hypointensity seen in the anterior half of the sacral base, which is reflective of marrow histological change (Type 2 Modic). Currently, only type 1 changes have been proven to be a source of LBP. 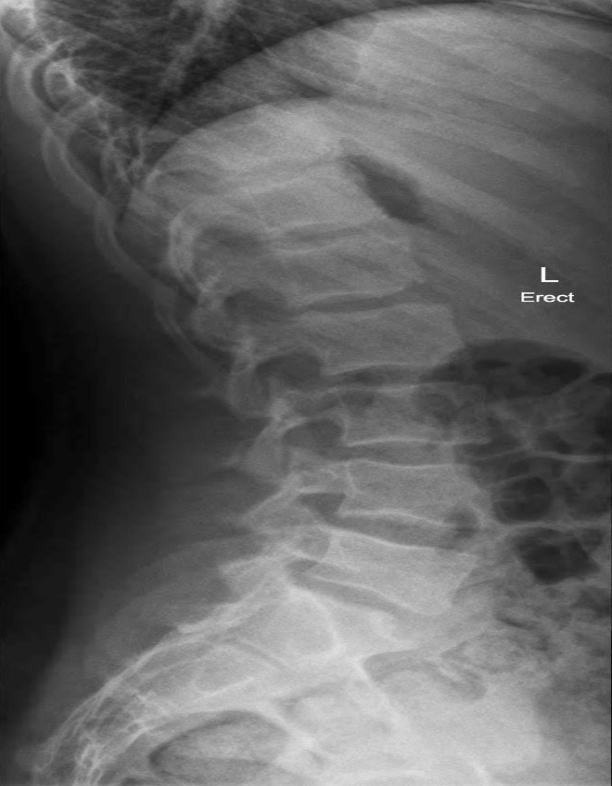 It is possible that at least some of this patient’s LBP can be attributed to the changes associated with the modic changes occurring at his vertebral endplates, and therefore his pain could be of vertebral endplate and subchondral bone origin. As stated previously, our patient had a sizeable area of Type 2 modic change in the sacral base, and this was not found in any of 439 thirteen year-old children in the Kjaer et al. study. A review by Dang et al. of current treatment for lumbar disc herniation made recommendations regarding management of childhood disc injury. They stated that conservative management of adolescent disc injury is the first choice treatment, particularly in those patients without significant neurological deficits. A growing spine is at risk to surgical trauma and other iatrogenic reactions that can develop after surgical intervention. However, with regards to LDH, current evidence agreed that success with conservative management for adolescent LDH is not as effective as it is for adults, and surgical complications are relatively rare. Written informed consent was obtained from the patient’s legal guardian [mother] for publication of this case report and any accompanying images. A copy of the written consent is available for review by the Editor-in-Chief of this journal.